Toys R Us Was Doomed to Fail! The most recent news of Toys R US (“TRU”) closing all its stores came as no surprise to (RE)meter. (RE)meter rated and identified, TRU as a High to Extreme Risk tenant beginning in 2012 an ongoing alarm for landlords to prepare for significant store closings. Sure enough, within 90 days of vowing not to close its stores, TRU announced it will begin to process lease terminations en route to complete U.S. liquidation. How Did (RE)meter See What Others May Have Missed? 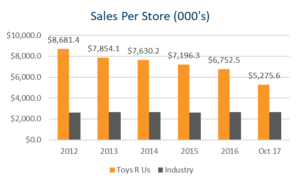 (RE)meter was able to rate TRU against 7,071 stores within the U.S. hobby, toy, and game industry. Rather than focusing only on TRU’s high debt issues, (RE)meter looked beyond the surface to understand how TRU compared to other industry stores in terms of growth, profitability, rent affordability, and productivity, as well as many other aspects of tenant performance. 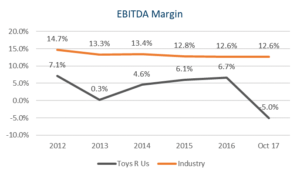 For instance, while TRU per store revenues were declining by 39.3% since 2012, “Their strategy was to not pay down debt or invest in existing locations, but rather to expand store locations; ultimately a poor business strategy”, says Scott Openlander Co-Founder of (RE)meter. 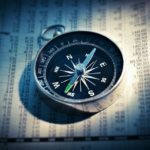 In addition, despite improvements from 2013 to 2016, TRU’s operating profits fell substantially short of industry norms, a benchmark often overlooked. Declining Sales While “TRU” per store sales were declining by 39.3% since 2012, the industry per store sales grew slightly at 1.5%. 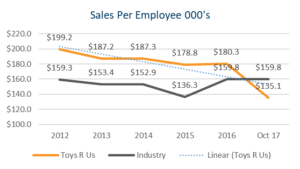 Productivity Declines “TRU” sales per employee, a measure of productivity, has declined since 2012, while its industry remained stable. Weak Operating Profits Although “TRU” operating profits were improving from 2013 to 2016, they are still substantially less than the industry norm. Strong operating profits are key to sustaining space and affording rent expense. 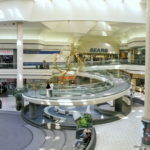 Unaffordable Leases Rent expense is a significant cost for retailers. Combine rent with build-out and payroll expenses, and leased space can quickly become the most significant expense for a retail company. A key understanding of tenant health is understanding the total capital needed to cover expenses for leased space. Thus, it is important to look at operating profits. For “TRU”, the weak operating profits generated from brick-and-mortar stores, i.e., leased space, create a very poor EBITDA-to-Rent ratio, translating to difficulty in affording rent. To be competitive with industry peers, “TRU” would have to improve its operating profit by more than 30 times! 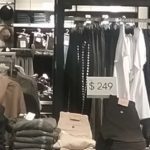 “TRU” initially announced a debt restructuring only to shift to a full liquidation and closure of all US stores in 6 months’ time! Landlords need to evaluate their tenants stores consistently to proactively plan for tenant defaults and store closings. 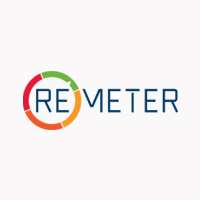 About Us (RE)meter is a technology venture disrupting an insufficient underwriting process in Commercial Real Estate. Contact Info@re-meter.com for more information.